« Mouser and D.C.G. : A Match Made in . . .
My initial thought this morning was that it probably wasn’t the wisest decision for local school districts to hold classes today. However, believing in the “walk a mile in the other person’s shoes” philosophy, I realize I’m not aware of all factors involved. I’m just glad I don’t have to make those cancel-or-not decisions, when many districts are already facing the difficult and potentially controversial task of determining how to go about rescheduling those “snow” days. 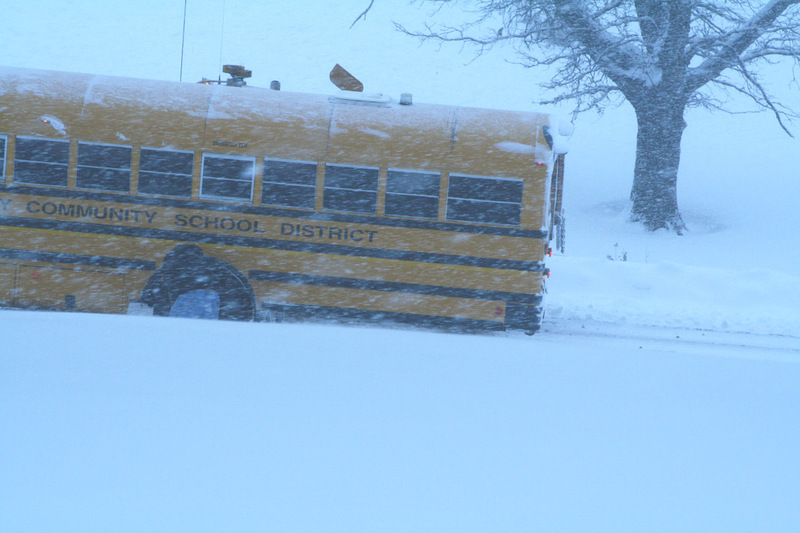 Winter weather has prompted some Iowa districts to cancel nine or more school days. (Yes, if you live in Iowa, you already know that, all too well.) And…it is only February 8th. Needless to say, this winter I’ve been so thankful I don’t still drive the Perry-to-Ankeny commute. However, I did have a stinky commute once when I was in grade school in the ’60s. I remember when, early one winter morning, we learned that buses wouldn’t be running complete routes, but that any students who could make the trek to school should attend. I was so excited because Gunderland (our farmstead) was on a gravel road that couldn’t be reached by the school bus that day. Wahoo! I didn’t have to go to school. But, oh, no. My dad, impressing upon us the value of our education, loaded us up in the tractor-pulled manure spreader and hauled us to Cornwell’s corner (4/10 mile away) where we boarded the school bus. This entry was posted on February 8, 2010 at 1:10 pm and is filed under Uncategorized. You can follow any responses to this entry through the RSS 2.0 feed. You can skip to the end and leave a response. Pinging is currently not allowed. Is the bus on the highway north of your house or on the street next to your driveway? Or maybe on the street west of your house? I, too, was transported via the manure spreader once. Clara: The photo is taken from inside our house and looking west. I.e., the bus is on the north/south part of the street west of our house just before the street curves back to the east. Since it was taken with a telephoto lens, the bus appears to be closer to the house than it actually is. I don’t ever remember Daddy using the manure spreader. Maybe it was before my time that he used it for manure and he just kept it around to make sure I could get to school! Do you have any recollection of him actually using the spreader for manure? I’ll share a story from my father-in-law Phil. He told me the other day, when we were talking about snow days and cold winters, that he remembers when the roads were closed with snow as a kid. Sometimes they would take the bobsled across the fields to the highway, so they could get to school. He doesn’t remember if they cut the fences to get through, or if the snow was high enough they just crossed over them. That’s not probably a unique story for the times, but it struck me how many changes have come in our parents’ lifetimes. And ours. Our kids would die if they had to be hauled in a munure spreader! Of course, we use ours quite frequently for the purpose for which it was intended! I also vaguely recall one snow day that mother insisted we all bundle up and go outside to play – to get us some fresh air probably but I’m sure to give her a break as well – and we walked across the fields to Olerich’s and built an elaborate snow fort.